Do we really need agnosticism nowadays? The inventor of the name ‘agnosticism’, the Victorian evolutionist Thomas Henry Huxley, certainly found it useful to have a word describing his lack of certainty when he was surrounded by those who seemed to have no such doubt. But then he lived in a period of transition. Science, and in particular biology, appeared to undermine old certainties. On the one hand, churchmen were promoting the importance of unshakeable faith. On the other, there were philosophers advocating a materialist and anti-religious outlook. Huxley felt he couldn’t identify with either side. If the Gnostics were those who claimed to have access to a special route to religious knowledge, then Huxley would be an a-gnostic, one who does not profess to know. But perhaps agnosticism served only as a temporary stopping point en route to a more satisfactory position, a stepping stone from faith to atheism. For Richard Dawkins, a scientist, writer and today’s perhaps most vocal atheist, we have already crossed that river. It was perhaps reasonable to be an agnostic in Huxley’s time, when it was not yet clear how science could answer some of the awkward questions posed by believers: How, if there is no divine designer, could intelligence have developed? What is the source of our moral conscience? Why was the universe so congenial to the emergence of life? Now we have some detailed answers, the idea of God is de trop. And so too is agnosticism, apparently. What is Dawkins’ thinking here? First, the agnostic’s point that we can’t know whether or not God does not exist, is not a very interesting one. There are lots of things we don’t know for sure. We don’t know that Mars isn’t populated by fairies. Of course, we are not remotely inclined to believe that it is, but still we don’t have conclusive proof. Nevertheless, we don’t describe ourselves as agnostics about Martian fairies. Similarly, atheists can admit that they don’t have conclusive proof of God’s non-existence. Second, not having conclusive proof does not make God’s existence just as probable as his non-existence. Moving from ‘not certain’ to ‘50/50 chance either way’ is what we might call the agnostic fallacy. Third, a necessary feature of God makes his existence highly improbable, namely his complexity. Of course, the world itself is complex – unimaginably so – but then science has an explanation of this complexity in terms of a series of gradual evolutionary steps from simpler states. In contrast there is no evolutionary account of God’s complexity: his nature is supposed to be eternal. And that there should just exist such complexity, with no explanation, is highly improbable. That’s a very plausible line of thought. The conclusion is that, unless you think you have overwhelming evidence for God, the rational thing is to be an atheist. But it rests on a questionable assumption. There is still room for an interesting form of agnosticism. Take a look at the third point above: that God must be complex, and so improbable. It is a part of traditional theology that God is in fact simple. Dawkins finds this incredible: how can something responsible for the creation of the world, and who has perfect knowledge of it, be less complex than that creation? There are, however, different kinds of complexity. A language is complex in one sense, in that it contains a virtually limitless range of possible expressions. But those expressions are generated from a finite number of letters, and a finite number of rules concerning the construction of sentences. A language may be complex in its variety but (relatively) simple with respect to the components and principles that give rise to that complexity. When the philosopher Gottfried Wilhelm Leibniz opined that God had created ‘the best of all possible worlds’, his view was mercilessly lampooned in Voltaire’s satirical novel Candide. ‘Best’ here, however, does not mean most agreeable, but rather where the greatest variety is produced by the simplest laws. And indeed it is a requirement on scientific explanation that it not involve needless complexity. Elegant simplicity is the ideal. Perhaps God is like that: his understanding and capacities may be infinitely complex, but the underlying nature that gives rise to that complexity may be relatively simple. If so, then it isn’t a given that the probability of such a being is enormously improbable. And if God is not clearly improbable, then atheism is not the default position. Rather, agnosticism is. If, before we start to look at the evidence, the hypothesis that God exists is initially no less probable than the hypothesis that he doesn’t, that neither atheism nor theism has a head start, so speak, then we should keep an open mind, rather than be atheists until presented by overwhelming evidence for God. So what is the point of agnosticism? That it stands for open-mindedness, for a willingness to consider conflicting perspectives, for tolerance and humanity. It may even be the basis for a religious life. Robin Le Poidevin is Professor of Metaphysics at the University of Leeds. His latest book is Agnosticism: A Very Short Introduction, which sets the philosophical case for agnosticism and explores it as a historical and cultural phenomenon. Some great points! Agnosticism has always seemed to me to be the most honest of the “scientific” viewpoints on theological questions. The most a “scientific” explanation can ever say is that there is no evidence/requirement for a supernatural factor in the explanation for a particular phenomenon. Atheism takes it further to assert there is no god (hmm, isn’t that attempting to prove the negative?). Maybe we need to put metaphysics back into the science core curriculum. Very interesting article. I also agree agnosticism is the most honest scientific viewpoint. Bertrand Russell: As a philosopher, if I were speaking to a purely philosophic audience I should say that I ought to describe myself as an Agnostic, because I do not think that there is a conclusive argument by which one can prove that there is not a God. On the other hand, if I am to convey the right impression to the ordinary man in the street I think I ought to say that I am an Atheist, because when I say that I cannot prove that there is not a God, I ought to add equally that I cannot prove that there are not the Homeric gods. Hmmmm … sounds like you have conflated “God” with the “natural laws of the universe.” Otherwise, what is the point of your “grammar” illustration? By the by, doesn’t any serious discussion of the existence of God have to begin with a definition of God? And a discussion of why a Jehovah-oid deity is a more probable or reasonable subject for further investigation than an Apollo or a Marduk or an Isis? How does any believer know there is a god? The brilliant author Margaret Atwood once described herself as a “devout agnostic.” I love this embrace of mystery, this acknowledgement that we don’t know, by some of our most intelligent writers and provocative thinkers. It gives me hope for our species. This is precisely why Hawking was so right in saying that philosophy has become irrelevant. Agnosticism is utter nonsense because it suggests that some form of scientific “proof” could theoretically be brought forward that would either prove or disprove the existence of God. The assertions “God exists” and “God does not exist” are not scientific propositions. A scientific proposition is one that is falsifiable. The assertion that God either does or does not exist is not falsifiable, and hence, it is a proposition that is not within the realm of science, it is within the realm of theology. One either believes in God or one doesn’t, and no amount of scientific inquiry is going to provide the answer. The position of agnosticism is not one of “open mindedness”, it is one of empty headedness. (A)theism is a position on belief. People that place agnosticism between atheism and theism are incorrect. Agnostic atheism is the most reasonable and open minded position. This shows the bias and lack of understanding of the author. Nobody would call such an entity a ‘god’. The religious always fail at philosophy. Dyz: Insults do not county as argument. How is that quote evidence of bias? What undertanding does it demonstrate a lack of and how does it demonstrate that? 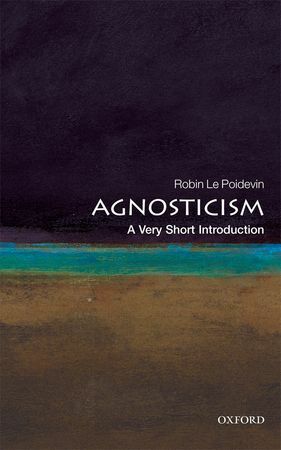 I think Le Poidevin rightfully promotes the position of agnosticism when addressing the God question for the first time without prior knowledge of the subject matter.